Former keeper Billy Gordon who has 721 appearances for Fraserburgh. Gordon made 721 appearances for the Broch between 1986 and 2010, keeping 193 clean sheets. In 427 of Gordon’s appearances the Broch conceded no more than one goal and lost only 34 of those games. The 51-year-old takes over from his former understudy Stevie Doak, who had been in the role for the last three seasons. Gordon is delighted to be back at Bellslea. He said: “I’m looking forward to the challenge of coaching three fantastic goalkeepers in Peter Tait, Paul Leask and youngster Edward Flinn. It feels like the right time for me to go back to coach the goalkeepers at Bellslea. 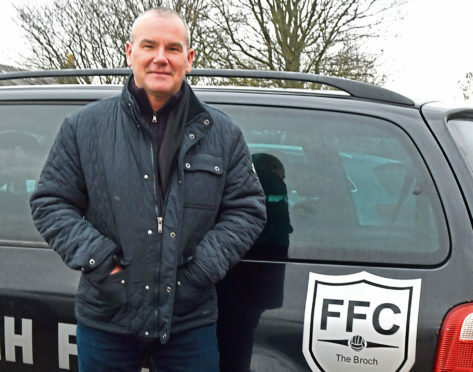 “After I stopped playing I went back as goalkeeping coach at Fraserburgh for a couple of seasons when my former team-mate Kris Hunter was manager. “I decided to take a break from the game to take my son Lewis to matches. “Almost every other week I’ve been watching Highland League football, so I know exactly what’s been going on. “A lot of the game is psychological from a goalkeeping point of view. Looking ahead to the new season, Gordon added: “Cove Rangers and Formartine United are going to be very strong as will Inverurie Locos, so I know how difficult it is going to be to win the league next season.